It's been a busy few weeks since I was working on the Tyrrell 6 wheeler. As the last stages of the car were going to be tricky, I decided to make something simple for the next Clacton club meeting. Ha! I pulled a box out of my stash that looked to be a quick task. 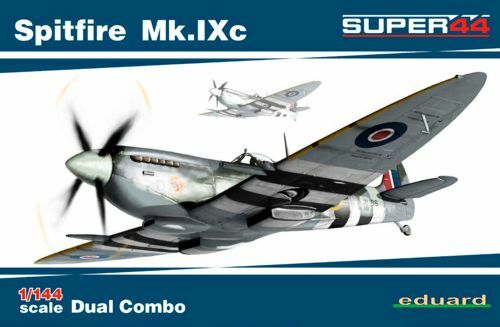 It was the Eduard 1/144th scale boxing of a pair of Spitfire Mk.IXc fighters. Looking through the five different paint schemes, I picked two easy ones. The first was from 312 Squadron based at North Weald down in Essex in late August 1944. The other, which I thought was quite interesting, was a bare metal version from 601 Squadron on Italy in the Summer of 1944. Both of these were chosen because of their lack of D-Day Invasion Stripes. I didn't want to get involved in painting these given the very small scale. I decided to make both in parallel which went very well. I left off the wheels/struts/doors to make handling easier. that didn't stop me breaking off the antenna on the bare metal aircraft though. I have done this before and it is fairly easy to make a replacement so I wasn't too worried. I wish that this was the only problem. When I had finished painting both aircraft, I noticed that the tailplanes of the 401 Sqn plane were loose so I removed them, meaning to glue them back on once the decals were in place. Somehow, one of the tailplanes went missing! I have searched high and low for it but it is nowhere to be seen. Again, fortunately, the scale is so small that I can probably make a replacement out of some plastic card, a bit of cutting and some judicious filing. I have yet to try that. 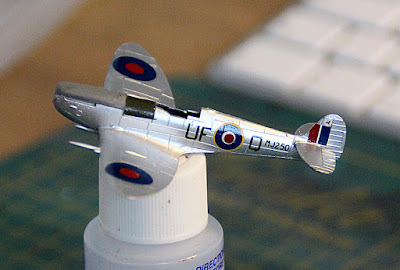 As that task would be a bit time consuming, I decided to finish the 601 Sqn plane first. I have got the decals in place. It doesn't look too bad. I will never understand why they print the roundels in three parts. Trying to line up the yellow outline, the blue and white part and then add the red dot to the middle - all on something that is about 6mm across is not easy. Still, I have done it. The panels in front of the cockpit are painted in the traditional RAF upper camouflage colours. The front part is in medium sea grey and the rear part is in RAF dark green. However, I only have Hannants Xtracrylix RAF dark green which is semi-gloss when it dries so I will have to touch up that part with some matt varnish. I am quite pleased with it so far. I still have the propellor and boss to fit plus the undercarriage. I then have to paint the gun covers (bright red) and it will be done. The other plane will be tackled once this one is complete. Here is where it is. Just to get some scale in all of this, the photos were taken with the models sitting on the top of a bottle of Micro Set. 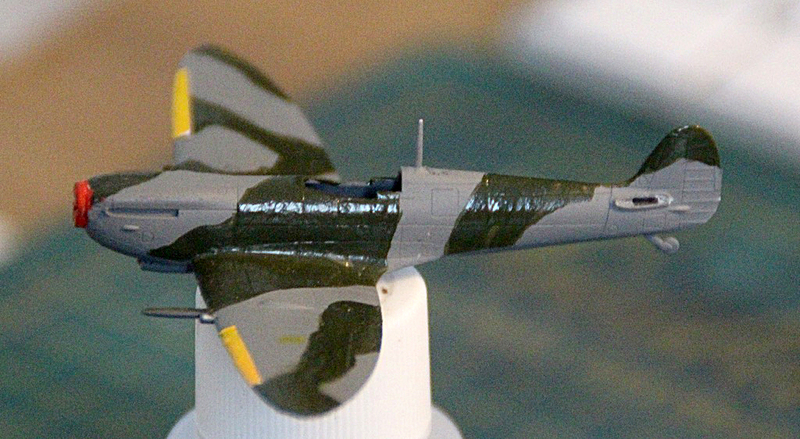 The white top that you can see is 22mm across and the Spitfire itself is just 60mm from nose to tail.